India wanted to see how their batting goes under pressure when they decided to bat despite knowledge there was early moisture in the Wellington surface to be exploited. What they found out was not all pretty as New Zealand reprised World Cup 2015 once again to reduce India to 18 for 4 but the middle order rallied to take them to a total they could fight with. 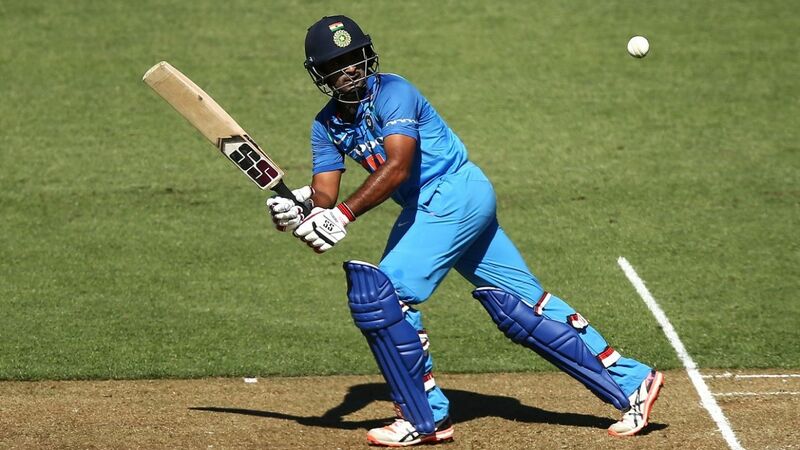 Under pressure, Ambati Rayudu led the revival with an innings of 90 that featured both seemingly dodgy defence and some sparkling stroke-play. Two allrounders played their part with 45s, Vijay Shankar off 64 balls to help rescue India and Hardik Pandya off 22 at the death. Now India had 252, which was 18 more than what England scored in the last ODI at Westpac Stadium. They won by four runs. At the toss, stand-in captain Rohit Sharma seemed to have laid his batsmen the challenge of getting a par total in testing conditions. The first part of that challenge was for himself and Shikhar Dhawan. It will be fair to say the top order was undone by the movement. Rohit got a beauty that is not part of the curriculum in ODI cricket. A full ball from Matt Henry pitched around middle and off, Rohit played the original line, and then the ball moved late to go past his outside edge and knock back the off stump behind him. Five overs later, MS Dhoni got another brute: Trent Boult getting a really quick ball to move back in against the angle and hit the top of off. In between, though, there were a couple of soft shots. Dhawan upper-cut Boult straight to third man, and Shubman Gill chipped one to square cover. This is the tricky part of the innings to judge. You want batsmen to buckle down when the ball is talking and is expected to quieten down after 15 overs or so, but you also don’t want them to totally shut shop. It is possible Dhawan identified the short ball as his scoring option, but here Boult cramped him up and he couldn’t get enough behind it. For the inexperienced Gill, after an early promising shot, the ball stopped a touch and lobbed up as he looked to drive on the up. A repeat of the 92 all out couldn’t have been ruled out at this point, but things were different here. The movement began to die unlike in Hamilton, but more importantly India had selected well for this match. Not only had they selected Shankar, an allrounder known to be more solid than spectacular with the bat, but they also promoted him to show exactly that. In his 45 off 64, Shankar looked the best equipped of the Indian batsmen to negotiate the tough conditions. He let the ball move, played it late, and had the wherewithal to pick up risk-free singles. In the early stages of this 98-run partnership, Rayudu hardly scored at all. He is that kind of a batsman: tough to put in any bracket, not always free-flowing but capable of hitting at unusual times in unusual areas. Rayudu was 5 off 32 when he wafted at a Colin de Grandhomme delivery, but that didn’t stop him from looking to hit in the air again in a short while. This six took him to 24 off 50, and India to 78 for 4 in 23 overs. At the other end, in what is a big credit to him, Shankar had inconspicuously scored 27 off 42. Just as the partnership began to assume dangerous proportions, with New Zealand having left the spinners till too late, Shankar was run out. He hit towards long-on, Rayudu shouted no and waited for the ball to cross short midwicket, Shankar stood in the middle of the pitch, and then Rayudu made a belated surge towards the striker’s end. Shankar sacrificed himself, and Rayudu proved him right with some imperious stroke-play later. Rayudu was 44 off 81 when Shankar was run out in the 32nd over, but he now capitalised on some hard work done. New Zealand had to bowl some of the lesser bowlers to keep Boult and Henry for the end, and he cashed in, hitting de Grandhomme and Colin Munro to take 46 off the last 31 balls he faced. Just when he threatened to score the first hundred of the series, though, he ended up slicing Henry to sweeper cover. Henry followed it up with a lovely slower ball to dismiss Kedar Jadhav. The depth in India’s batting shone, however. Pandya first ruined Todd Astle’s figures after he had done a stupendous job when bowling at the death. Before Pandya took him for a hat-trick of sixes – for the fifth time in his international career – Astle had bowled cleverly and conceded just 17 in 4.1 overs. Pandya, though, unleashed mayhem, hitting five sixes in all and two fours. One of those fours was perhaps his best shot. He dug out a near perfect yorker from James Neesham, but came down so hard on it he manufactured enough power on it to beat short third man. A catch just as spectacular – one that should go in an already impressive highlight reel for Boult – contained the damage and possibly denied India 10 more runs.